The Rams were smart to pay Todd Gurley sooner rather than later. Le’Veon Bell spent more than two years pushing for a contract averaging $15 million per year, but the running back who finally got that number was the Los Angeles Rams’ Todd Gurley. 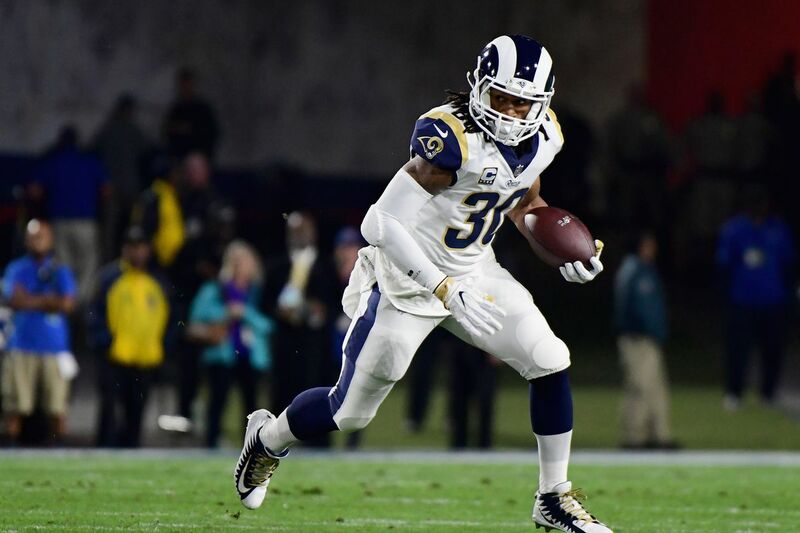 The Rams announced a new deal with Gurley on Tuesday, and according to ESPN’s Adam Schefter, it’s a four-year extension to his contract worth $60 million with $45 million in guarantees. Gurley, 23, was named the 2017 NFL Offensive Player of the Year after finishing the season as the league leader in yards from scrimmage (2,093) as well as rushing and receiving touchdowns (19). His contract is the largest ever for a running back in terms of both guarantees and annual averages. But what do the ramifications of the contract mean for the Rams, Aaron Donald, Le’Veon Bell, and other running backs in the NFL? When Le’Veon Bell didn’t get a new contract from the Pittsburgh Steelers prior to the July 16 deadline for players under the franchise tag, it meant the three-time Pro Bowler’s time in Pittsburgh is almost definitely coming to an end. Barring a surprising reversal of fortune, Bell is going to reach free agency in March. The open market will likely mean he sees the big money that the Steelers were never fully willing to part with. That essentially gave the Rams eight months to get a contract done with Gurley before Bell signed a huge deal that set a new standard for top running backs. With David Johnson of the Arizona Cardinals also hoping for a new contract soon, the Rams had to race to get a deal done as soon as possible. A four-year, $60 million may not sound cheap, but when added to the two years and $11.95 million that Gurley had left on his rookie contract, it amounts to a six-year, $71.95 million deal for the running back. The $11.99 million per year salary due to Gurley is a good amount for the Rams considering where Bell will likely push the market. Bell has had his sights set on a contract that averages $15 million per year, and that number looks more realistic than ever. Gurley’s new deal easily eclipses the top long-term running back contract in the NFL, which previously belonged to Devonta Freeman. The Atlanta Falcons running back signed a five-year, $41.25 million deal last year that averages out to $8.25 million per season. Gurley reset the market, but the Rams were smart to get ahead of the wave of contracts headed to Bell, Johnson, Ezekiel Elliott, Jordan Howard, and other young running backs. The contract extension for Gurley isn’t the greatest news for Bell, but it isn’t bad news either. With the full value of Gurley’s deal amounting to essentially $12 million per year over the next six years, Bell is still going to be hunting for more when he presumably becomes a free agent next offseason. Both players are bona fide No. 1 running backs who average more than 1,000 rushing yards per season, and are significant contributors in the passing game. Gurley caught 64 passes for 788 yards and six touchdowns in 2017, while Bell had 85 receptions for 655 yards and two touchdowns. Bell can use the framework of the four-year, $60 million extension and his comparable stats to aim for a contract that totals about $15 million per year. He’ll also be helped by the competition of the free agency market which pushes up prices. But the real winners is the entire running back market, which is probably going to see a wave of money headed its way now that Gurley pushed the numbers much higher. It’s not the worst time to be a starting NFL running back right now. Don’t worry, Aaron Donald. There’s still money for you. The Rams are giving out money left and right this offseason, but the notable exception has been Aaron Donald, the 2017 Defensive Player of the Year. Donald, 27, is set to play the 2018 season on the fifth-year option of his rookie contract. He’s been asking for a new deal for more than a year and will likely hold out from training camp again until he gets one. So it raises eyebrows to see another Rams player get a premium contract while Donald continues to wait. But the Rams — for all their big spending — still have plenty of money to dish out. It’s a luxury that comes with having a quarterback on a rookie contract, and even after the Gurley deal, the Rams are still among the league leaders in cap space for 2019 and beyond. As long as the Rams are able to structure a deal that doesn’t increase Donald’s salary cap hit in 2018 much — something that isn’t difficult to do — it still won’t be difficult for the team to make sure he’s in the long-term plans. Yes, the Rams spent big money to add players like Ndamukong Suh and Aqib Talib to the roster, but the nucleus of the team for the foreseeable future is its trio of young stars: Donald, Gurley and Jared Goff. One was secured through the 2023 season today, and Donald probably won’t have to wait long for his turn next. The Seahawks’ bad draft luck is taking a toll on the team’s roster. 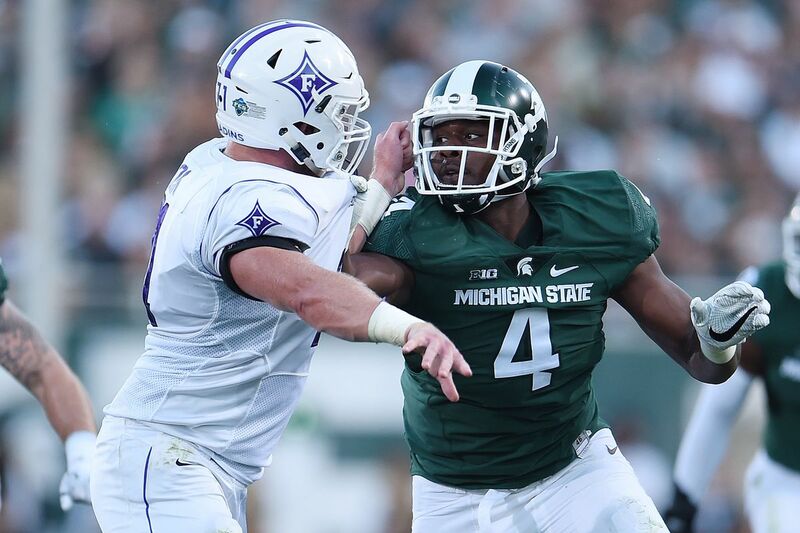 The Seattle Seahawksparted ways with defensive tackle Malik McDowell on Thursday, just over a year after the team picked him in the second round of the 2017 NFL Draft. McDowell never took a snap or donned a Seahawks uniform before an ATV accident in July 2017 caused injuries that ended his rookie year before it ever began. The details of his injury were never revealed, but over a year later, the Seahawks still weren’t ready to medically clear the lineman. If McDowell is healthy enough to play again, he’ll have to hunt for another NFL team willing to give him a chance. For the Seahawks it’s another bad pick in a string of poor draft choices in recent offseasons. McDowell was the first pick Seattle made in 2017, putting him in an underwhelming group. Part of the problem for the Seahawks has been draft position. Of those six selections, only three were in the first round and Irvin was the only one picked in the top 20. But the Seahawks’ struggle to find a premium player early in the NFL Draft is partially to blame for the team’s recent decline. The 2017 season was Seattle’s first since 2011 that didn’t reach 10 wins or end with a trip to the playoffs. The 2018 offseason was particularly rocky for Seattle. The defense lost Richard Sherman, Cliff Avril, Michael Bennett,Sheldon Richardson, and Kam Chancellor, and the Seahawks are in the middle of a contentious contract dispute with Earl Thomas. Struggling to find young replacements for those cogs is a problem. It wouldn’t be fair to blame the Seahawks for McDowell not living up to his draft hype in Seattle. But the team’s bad draft luck is taking its toll on the roster. After he was released, Bryant said he would like to play for another NFC East team so he could get a chance to play against the Cowboys. That seems unlikely to happen, though Slater said that an unnamed team — not the Browns — was interested in Bryant and wasn’t put off because of his tweets. Jerry Jones says it’s problematic that Donald Trump, who he involved, is involved in the anthem conversation. In May, NFL owners unilaterally passed a policy that they hoped would end an enduring narrative of protests during the national anthem. 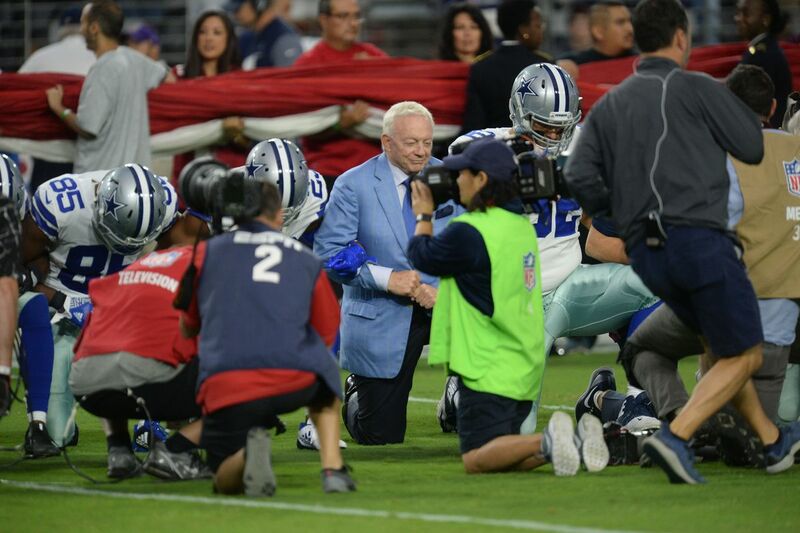 Dallas Cowboys owner Jerry Jones, who has been one of the most vocally opposed to players kneeling or otherwise protesting, helped lead the effort. Two months later, that policy is on hold amid public backlash and a grievance filed by the NFLPA. Owners were recently “instructed to stand down” while the NFL and NFLPA discuss a plan moving forward about protests, according to Bengals owner Mike Brown. But Jones couldn’t help himself. This really isn’t that surprising. 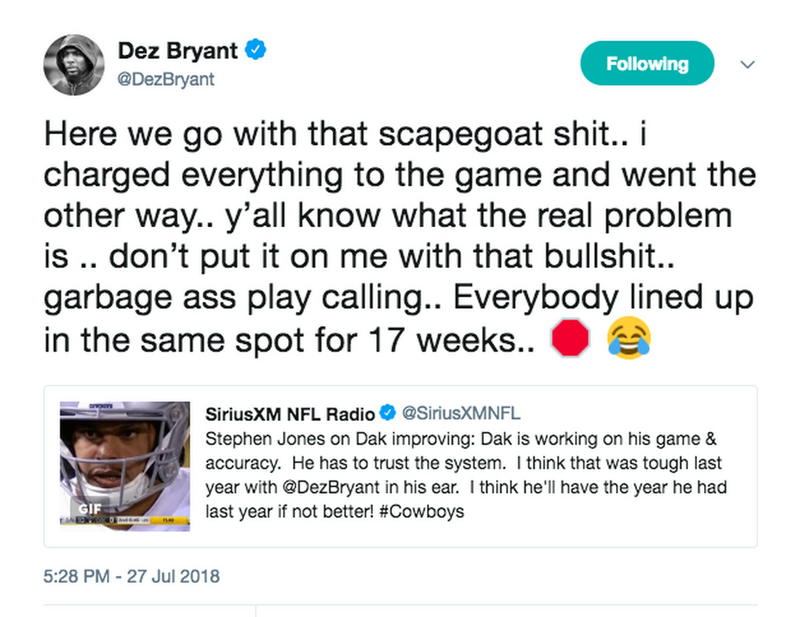 In October 2017, Jones told the media that any players who “disrespect the flag” won’t play for the Cowboys. A few days later, he held a meeting with the team that didn’t seem to go over well with players. So Jones’ policy that Cowboys players must exit the locker room for the national anthem and “stand for the anthem, toe on the line” isn’t anything new. It does, however, directly oppose the “compromise” he and the other NFL owners constructed in May when a new national anthem policy was passed. That policy said that players could stay in the locker room to protest, but must stand and “show proper respect for the flag and anthem” if they’re on the field during the national anthem. By sticking to his solution of trying to end protests by force, Jones is continuing to drive a wedge between players and ownership. He’s also making it clear that — while the NFL and NFLPA are discussing how to move forward — he has no intention of working together with the players. Jones wants the protests gone on his terms and his terms only. A couple days later, Philadelphia Eagles safety Malcolm Jenkins called Jones a bully who is using his position as owner to intimidate any player who dares to think individually or have voice. But Jones didn’t stop there Wednesday. Jones, a longtime friend of Donald Trump’s, telling reporters that Trump’s involvement is problematic is ironic considering Jones directly involved him. It was the Cowboys owner who had phone calls with Trump about protests and relayed those messages to other owners during league meetings. Trump’s comments about NFL players protesting were part of the reason a new policy was passed in May, and it was Jones who brought them to the meeting. If Trump’s involvement is problematic, it was partly Jones’ decision to involve him. And if the goal of a new anthem policy was to take Trump out of the conversation, it didn’t work. Trump didn’t stop speaking negatively and tweeting criticism of NFL players after the new anthem policy was adopted. Jones should’ve seen that coming because Trump told him that criticizing players “a very winning, strong issue” for him, according to the Wall Street Journal. And for good measure Wednesday, Jones said he’s still a supporter and owner of several Papa John’s stores, despite recent news that founder John Schnatter used a racial slur on a conference call. Schnatter, who resigned as chairman and then immediately regretted doing so, would like a “do-over,” according to Jones. According to the Fort Worth Star-Telegram, Jones is no longer talking about the anthem after the backlash last week and canceled several interviews as a consequence. If Jones had a do-over, it probably would’ve been smart to stick to the NFL’s request for owners to stand down for now, because only made things worse last week. The NFL is running the risk of adding an ambiguous and inconsistent rule. In March 2018 NFL owners voted to approve Article 8 of the rulebook, better known as the helmet contact rule, an effort aimed at taking head-first collisions out of the game. It’s an attempt to make the game safer, but in the months since passing the new rule, it’s resulted in some controversy and lots and lots of confusion. Discussions about curbing the worst collisions in the sport led to the drafting of a new rule that quickly went to a vote. At the league meetings in March, when the rule was initially approved, it was laid out in simple terms stipulating that “it is a foul if a player lowers his head to initiate and make contact with his helmet against an opponent.” The rule that passed also made it so that players could be disqualified. 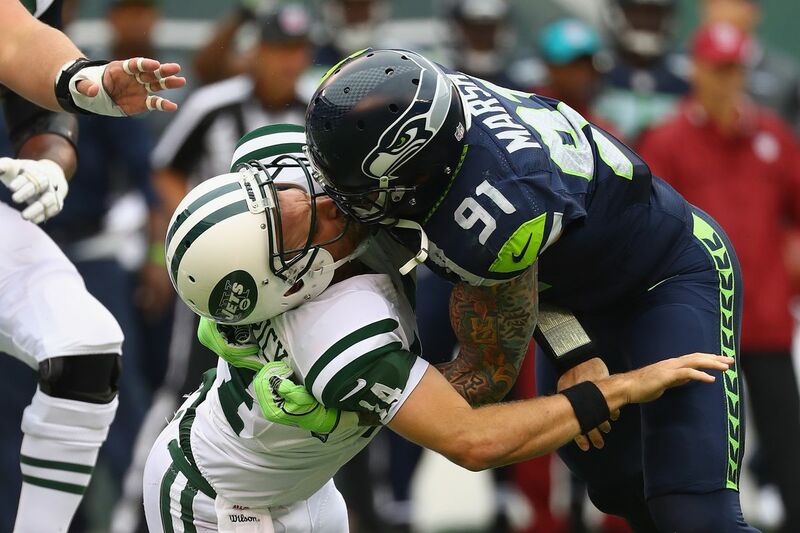 It is a foul if a player lowers his head to initiate and make contact with his helmet against an opponent. Contact does not have to be to an opponent’s head or neck area – lowering the head and initiating contact to an opponent’s torso, hips, and lower body, is also a foul. Violations of the rule will be easier to see and officiate when they occur in open space – as opposed to close line play – but this rule applies anywhere on the field at any time. It doesn’t exactly mirror college football’s targeting rule, but it does The NFL rulebook take a page out of the college book and be expanded to protect players further from helmet-to-helmet contact. What’s different about the NFL now with the new rule? Among the examples from McKay of a newly illegal hit was the attempted tackle by Pittsburgh Steelers linebacker Ryan Shazier that ended his season in 2017. Shazier’s attempted tackle is both an example of tackling technique that the NFL is trying to take out of the game, and a play that would be difficult to correctly officiate if it’s now illegal. The likely result is it will only be used when an egregious hit occurs. But that brings plenty of ambiguity and judgment into play. Earlier this spring, the NFL got positive reviews for changing a catch rule that was plagued by those same issues. Now the league is running the risk of adding a rule that’s just as controversial and inconsistent. Is the new rule reviewable? It is not, unless it results in a player being ejected. At the same May meeting where the league laid our clarifications for the new helmet rule, owners approved a rule change that added ejections to the list of reviewable decisions. Is this like the college football targeting rule? The NFL did consider whether or not automatic ejections are part of the language included in the new rule, ultimately deciding against it. The biggest similarity between the NFL’s new rule and college football’s targeting rule is the last sentence that outlaws the lowering of the helmet to initiate contact. But for now, the NFL hasn’t officially added an automatic ejection, although that could be on the way. What is the NFL and what are players saying about the change? The league’s stance about the change doesn’t seem to indicate that they expect a huge difference on the field. According to the competition committee, it would’ve resulted in just 5-10 more ejections during the 2017 season. Players are unimpressed, though. Some of the league’s most vocal defensive players have expressed concerns. Following those comments, Goodell said players reacting to the new rule haven’t had a chance to sit with the league and understand its intent and implementation. But meetings with officials as training camps have opened haven’t done much to reassure players or clarify the new rule to them. Eagles players were vocal about being even more confused by the rule after a sit down with refs. In perhaps the most troubling sign of the confusion to come over the rule came when refs were asked about safety Malcolm Jenkins’ hit on then-Patriots receiver Brandin Cooks in Super Bowl LII. The officials on the scene couldn’t agree if it was legal or not. For now, teams are spending time at training camp going over the “Way to Play,” i.e. the NFL’s term for how to properly use the helmet while tackling, hitting and blocking. Expect to be hearing PLENTY more about the new helmet rule every week throughout the preseason and regular season. My picks for 2016 super bowl 50, Panthers vs Broncos!!!! Newton vs Manning showdown!!! I predict the score, and stats for players on each team!